Have you ever noticed that everything we eat nowadays has a best before date? Let’s not talk about cooked food which must be consumed within 24 hours in order to relish their flavour, nor about canned goods which already have preemption dates.Am also not talking about perishable goods such as fruits and vegetables. Most industrial foods have preemption dates and to my surprise, eggs also do. Yes, we usually buy them from the nearby la boutique sinois and would normally keep them for weeks without ever worry about best before date. Imagine my surprise one day when i try to make an omelette. 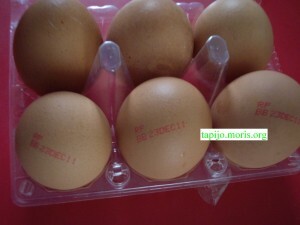 I noticed the best before date(which was due a day before) on the egg. Did not pay any attention and broke it. When i whisked the yolk, it did not rise much to my dismay. So much so for a much desired omelette.The taste also is different from the one 20 years back. Plain and not savory. Sometimes i wonder about what are in our plates. Are the foods we eat any natural at all? You also get genetically modified vegetables. Lately we have heard so much about securite alimentaire, but are we really doing something about it or is it just some lousy words on paper? So, wanna share any differences in taste you have noticed about the foods you ate recently compared to some decades back? Is it better or worse?